President Donald Trump’s temporary travel restrictions on seven countries has polarized the US public, with critics calling it a “Muslim ban” unfairly singling out a religion and proponents defending it as necessary for Americans’ safety. 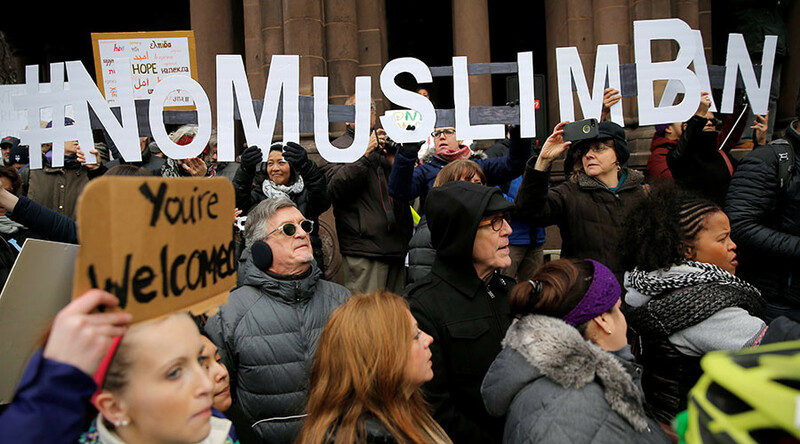 The Trump administration has rejected the descriptions of the January 27 order as a “Muslim ban,” noting that more than 40 Muslim-majority countries in the world are not affected by it. President Barack Obama indeed ordered a review of all background checks for Iraqi refugees resettled in the US and imposed new security requirements on any new ones, after the May 2011 arrest of two Iraqis in Bowling Green, Kentucky. The duo was captured in a FBI sting operation and charged with conspiring to send material support to Al-Qaeda in Iraq. 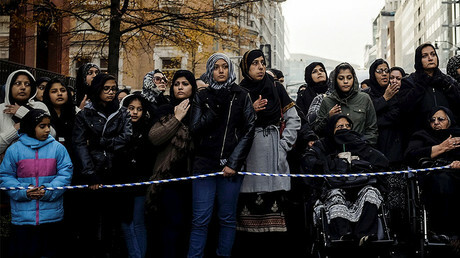 The investigation showed the men lied on their immigration paperwork and had previous ties with terrorists; one’s fingerprints were even found on an unexploded bomb in Iraq. While Obama’s decision did not amount to a ban, in practice the increased scrutiny resulted in “significantly fewer” refugees entering the US in 2011 and 2012. According to a report compiled by the Congressional Research Service, the number of refugees in 2011 was 26,500 below the allotted 80,000, while the shortfall in 2012 amounted to 17,700 fewer than the reduced quota of 76,000. The National Security Entry-Exit Registration System (NSEERS) program was introduced by President George H. W. Bush in 1991 during the first Gulf War, when US immigration demanded fingerprints and registrations from certain travelers from Iraq and Kuwait. While the requirement was dropped by 1993, the legal structure remained in place. President George W. Bush resurrected the registry following the terrorist attacks of September 11, 2001. The list of countries affected was expanded to include Iran, Libya, Sudan and Syria. By 2003, the NSEERS applied to 25 countries, all but one with Muslim majorities: Afghanistan, Algeria, Bahrain, Bangladesh, Egypt, Eritrea, Indonesia, Iran, Iraq, Jordan, Kuwait, Lebanon, Libya, Morocco, North Korea, Oman, Pakistan, Qatar, Saudi Arabia, Somalia, Sudan, Syria, Tunisia, United Arab Emirates, and Yemen. The Obama administration discontinued the use of the registry in 2011, and officially shut down the NSEERS in December 2016. The official reasoning was that the program had become obsolete and inefficient. In practice, it had been expanded to everyone entering the US, through the US-VISIT program (Visitor and Immigrant Status Indicator Technology) introduced in 2007. “We will not reissue visas, nor will we issue new visas, except for compelling and proven humanitarian reasons or where the national interest of our own country requires. This directive will be interpreted very strictly,” the order said. The ban was lifted in 1981, after Iran released the US hostages. While refugee admissions were suspended for a short time after the 9/11 terrorist attacks, refugees from Muslim-majority nations accounted for an ever-larger percentage of the total US admissions in the years that followed. The final guidance documents issued by the Obama administration increased the US refugee admission quota to 110,000. Of those, 40,000 were supposed to come from the Near East and South Asia, specifically from Syria, Iraq, Iran, Pakistan and Afghanistan – and a very small group of Bhutanese refugees living in India since the 1990s. The same document included an allocation for 35,000 refugees from Africa, primarily from Congo, Somalia and Eritrea – the latter two being majority Muslim. Trump's executive order has temporarily halted all refugee admissions, pending review. While the Organization of Islamic Cooperation has expressed concern over Trump’s executive order, at least one prominent Gulf Arab statesman did not seem perturbed. “Countries have the sovereign right to make decisions to ensure their sovereignty. The US president used this sovereign right,” Sheikh Abdullah bin Zayed Al-Nahyan, foreign minister of the United Arab Emirates, said on Wednesday at the press conference in Abu Dhabi after meeting with the Russian Foreign Minister Sergey Lavrov. “There are attempts to claim that this decision is aimed against a religion, but it is not aimed against a specific religion. This is a temporary decision, it is important to take these points of view into account,” Al-Nahyan added.